It was Bible Study night. Boy, that takes a great deal of faith, doesn’t it? 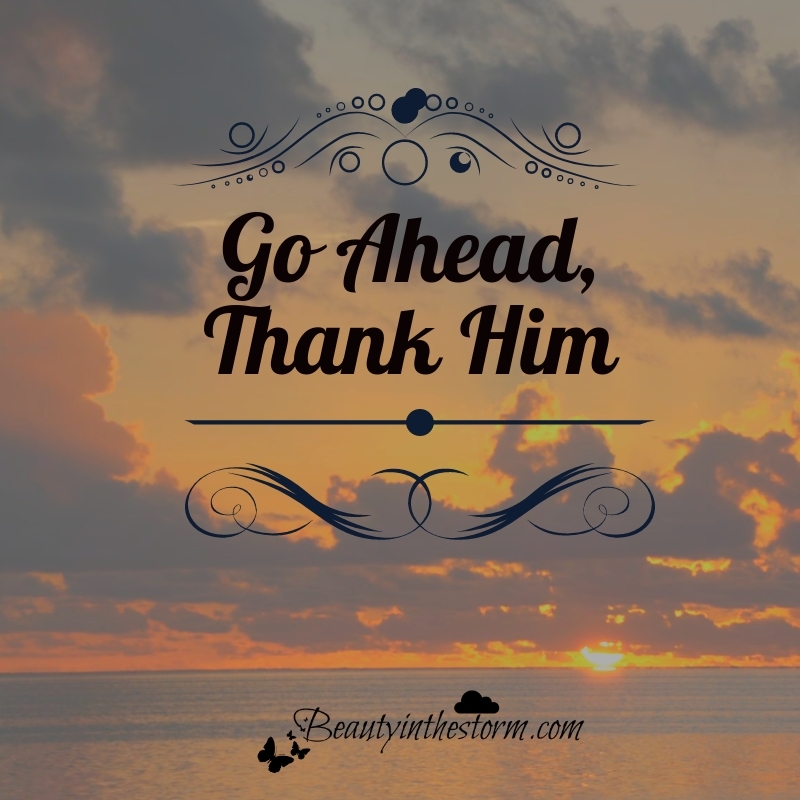 To praise God and thank Him for something you do not have the answer to, yet? It means you have to swallow the doubts. You just simply have to trust. And thank Him, knowing in ADVANCE, that He is going to bless you with His answer. I started out trying it in a round-about way. I thanked God for giving me HIS perfect answer. I did this, because it avoided having to thank Him for answering exactly the way my heart wanted. It left room for my doubt. And if I left room for my doubt, then I couldn’t be mad at God for answering in a different way, right? HIS way? But the thought kept prodding my heart. Thank Him in ADVANCE for what He is going to do. Thank Him in ADVANCE for answering your prayer. Are you afraid, like I was? It’s okay you know. He knows we’re afraid. But He wants us to trust Him. Not halfway. Not just a little bit. But completely. So pray. Ask away. And then thank Him. Thank Him now. Thank Him for what He’s about to do. Thanks for the encouragement in this post! What a step of faith it is to trust God ahead of time, when we don't know exactly how He will choose to answer. Yet we know He is a good God, who does all for our best, so we can indeed make that choice to praise Him in advance! Tracey - I never got notified of your comment, so I am sorry I am so late in replying. I am so glad you were encouraged by this post.